Cook the bacon in a large skillet over medium heat until crisp and fat is rendered. Remove bacon with a slotted spoon and set aside. To caramelize the onions add the oil to the bacon fat, then add the onions and thyme. Cook for 35-40 minutes, turning frequently to avoid burning, until the onions are reduced in size and a deep golden brown. Remove onions from the skillet and wipe clean. Starting one tortilla at a time, place the tortilla in the skillet and add three dollops (around 3 tbsp) of the goat cheese to one side of the tortilla. Top with the onions and bacon and fold the other side over. 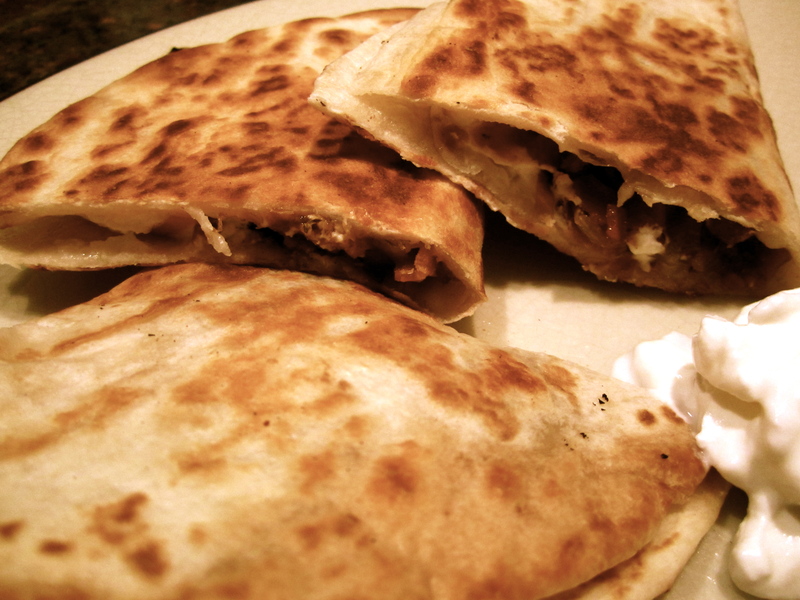 Cook until the tortilla is a light golden brown, and the cheese is melted. Repeat for the remaining tortillas. Serve with a dollop of sour cream for dipping and garnish with the bacon bits. If you’re making this as a meal, double the recipe for 4 people, or this will suffice for 2. I also like to serve my quesadillas with some home made guacamole and salsa!! Yields 4 appetizer servings…double the recipe for your next “Idol” watch party! In a large sauce pan, over medium heat, cook the bacon until crisp and the fat is rendered. Remove the bacon with a slotted spoon and set aside. Saute the onion until soft, stirring frequently for 2-3 minutes. Add the jalapeno and saute for 2-3 more minutes. Add the garlic and saute until fragrant, around 30 seconds. Add the beans and the next 4 ingredients through the water. Simmer until water is evaporated and ingredients are married, around 2-3 minutes. Place the bean mixture into a food processor and blend, slowing pouring in the 1/8 cup of water until a creamy consistency is reached. 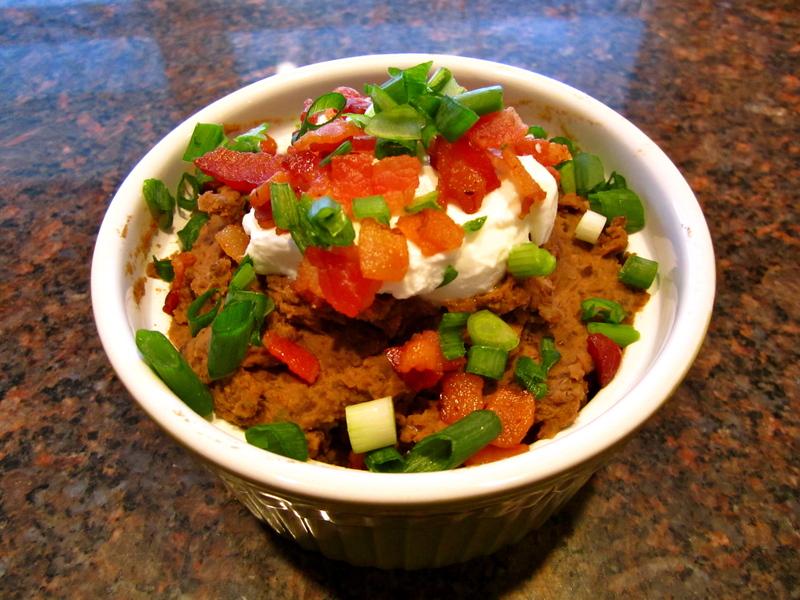 Serve topped with a large dollop of sour cream and sprinkled with the green onion and reserved bacon bits. Send your recipe ideas my way!!! Lotus Flower – The King of Limbs!